It is now nearly fifty years ago that von Laue, whose recent sad death has caused us so much grief when we were all looking forward to having him with us here, made his discovery of X-ray diffraction by crystals. I propose in this talk to survey the stages by which the science of X-ray analysis has developed since that time. It is interesting to trace the influences which determine the rate of development of a science. It was a favourite saying of my father's that, after a year's research, one realizes that it could have been done in a week. This saying must of course not be interpreted literally. There are many cases in research where data have to be laboriously collected before one can arrive at an answer. He was, I think, referring to the fumblings of thought, the exploration of alleys which turned out to be blind, the lack of knowledge of some vital bit of information which was there for the asking if one had known where to ask. All of us must have said to ourselves at one time or another, when at last a solution was reached, 'How blind I have been'. * Congress Lecture given at the Fifth International Congress of the International Union of Crystallography in Cambridge, 1960 (adapted). X-ray analysis is particularly a subject where a review of this kind is fascinating, because it is so well integrated. It is a branch of research with a discipline of its own, and one with features rather unlike those of any other science. Those who pursue it are a very closely united band, who talk the same language and keep closely in touch with each other. At the same time it is a typical border-line science, which has had a great influence on many other sciences, and has used their body of knowledge as a basis for its discoveries. It is convenient to divide the story into certain periods and I propose to take each in turn, discuss the important advances during the period, and sum up the stage which the subject had reached at its end. Our first period, starting with von Laue's discovery, may be taken to end in 1920. It includes the First World War, a time when little research was possible, but even during the war there were some outstanding contributions, and at the end of it a foundation had been laid on which all subsequent work has been based. The next decade, 1920-1930, witnessed X-ray analysis taking shape as a quantitative science, with the result that it could be extended to more complex structures. The next decade, 1930-1940, saw the Fourier series developing into maturity as a standard method of attack; its principles had been realized much earlier but only in that decade did it begin to play an essential role. The Second World War interrupted research far more completely than the first. Science played a far larger part in it, and scientists had to abandon all thought of research, so in a general survey of this kind we may consider it as a blank period and take our next decade to be 1945-1955. To me this decade appears as the flowering of the trial and error methods of X-ray analysis, which except in a few favourable cases had been characteristic of X-ray work from the start. The phase difficulty was accepted as a necessary concomitant of X-ray analysis, and the outstanding researches were characterized by brilliant tours de force in which success was attained in spite of it. Finally, the decade in which we are now living, from 1955 onwards, is one in which a great stride forward has been made. The structures which are tackled are so complex that no trial and error methods could possibly succeed. X-ray analysis has assumed a new aspect in which the phase difficulty must be and has been defeated and since the new methods are direct methods, machines can be our slaves to handle vast masses of data because they can be given clear and precise orders. We may perhaps liken these stages to geological eras, and say the primary extended until 1920, the early and late secondary from 1920 to 1940, the tertiary up to 1955, and say that we are now living in a quaternary age of X-ray analysis. Any such divisions are of course arbitrary, and only justified as a skeleton plan on which to base our review. I intend to use as illustrations outstanding contributions which are landmarks, but it will be realized that it is impossible to refer to all such events and if the work of a particular school is reviewed in some detail, it is because it affords a measure of the advance of the subject, not because it was the only work of its kind at the time. Let us now review the first period during which the foundation of X-ray analysis was laid, and try to trace the interplay of the various lines of thought and experience which gave it birth. The story of its start in 1911 and 1912 has been told at length in Chapter 4 and need not be repeated here. I start the account therefore from the moment my father began his work. My father was intensely interested in von Laue's results because at the time he upheld the theory that X-rays were a type of corpuscular radiation, the neutral pair theory. This theory was not so strange as might appear. He had been led to it by deducing, what we now know to be true, that when X-rays ionize a gas the energy is handed over to individual electrons here and there in the gas, as if they had been struck by a projectile. It must be remembered that this was before the days of the Wilson Cloud Chamber, and before the dual wave and particle nature of radiation had become a familiar idea. We had many discussions about the results in the summer holiday of 1912, and when I went back to Cambridge as a research student in the autumn I pored over von Laue's pictures. Here again chance played a part. It must be difficult nowadays to imagine how utterly unaware physicists were at that time of the geometry of three-dimensional patterns. I happened to know a little about it, because Pope and Barlow had proposed a valency-volume theory of crystal structure which although incorrect was highly suggestive, and a member of a small scientific society to which I belonged had given a paper on this theory. It brought home to me the fact that atoms in space lattices were arranged in planes! J. J. Thomson had been talking about the pulse theory of X-rays, and to cut a long story short I explained von Laue's results as due to the reflection of a band of 'white' radiation by the planes of the crystal. I published a note in Nature showing the reflection of X-rays by a mica sheet at a series of angles. Further, I showed that the spots von Laue had obtained with zincblende were characteristic of a face-centered cubic crystal, having heard about such a thing by studying Pope and Barlow's papers. Pope was intensely interested and encouraged me to try Laue photographs of NaCl and KCl, in which he also believed the atoms to be in cubic close packing. These results established the structure of the sodium-chloride group of crystals (NaCl, KCl, KBr, KI). This tentative start of crystal analysis, however, was soon completely superseded by my father's development of the X-ray spectrometer at Leeds, and I think one can trace the reason why the lead in crystal analysis so rapidly passed to this country although it had started in Germany. My father was supreme at handling X-ray tubes and ionization chambers. You must find it hard to realize in these days what brutes X-ray tubes then were. One could not pass more than a milliampere through them for any length of time or the anticathodes got too hot. The discharge drove the gas into the walls; one then held a match under a little palladium tube which allowed some gas to diffuse through and so softened the tube. The measurement of ionization with a Wilson goldleaf electroscope was quite an art too, and my father had thoroughly mastered all the techniques in his researches. The great strategical importance of the ionization spectrometer was that it enabled reflections to be studied one by one. The discovery of three characteristic lines A, B, and C, of Platinum was announced in April 1913 and my establishment of the rocksalt structure enabled wavelengths to be assigned to these lines. It is not generally realized, I think, to what an extent my father founded the science of X-ray spectroscopy in 1913. He had tubes made with anticathodes of Platinum, Osmium, and Iridium, of Palladium and Rhodium, and of Copper and Nickel. He found the wave lengths of their characteristic lines, and by measuring absorption coefficients he identified them as Barkla's L radiation in the Platinum group of elements, and K radiation in the others. Whiddington had established the energies of the cathode rays required to excite Barkla's K and L radiations in atoms of different atomic weight, so my father was able to link wave-length with energy and show that the relation was in agreement with Planck's quantum law. He found the K line pattern and the L line pattern to be similar for successive elements, and showed that the frequencies increased roughly as the square of the atomic weight (June 1913). He identified the absorption edges, as they are now termed. The link with Moseley's work is interesting. Moseley and Darwin had surveyed the spectrum emitted by a platinum anticathode, but missed the characteristic lines owing to setting their slits too fine. My father's success encouraged Moseley to review the lines for a continuous series of elements from aluminium to gold. Bohr was then at Manchester, and Moseley's triumph lay in explaining the succession of frequencies by Bohr's theory of spectra and so identifying the atomic number as the number of positive electronic charges in the nucleus (April 1914), as had been suggested by Van den Broek in the previous year. I had of course the heaven-sent opportunity at this stage of joining in the work with the ionization spectrometer. My father was more interested in X-rays than in crystal structure, and I was able to use the spectrometer for investigating the latter. We published the diamond structure together, and I established the structures of ZnS, FeS2, CaF2, NaNO3, and CaCO3. The structure of pyrites, FeS2, provided the greatest thrill. It seemed impossible to explain its queer succession of spectra until I discovered, going through Barlow's geometrical assemblages, that it was possible for a cubic crystal to have non-intersecting trigonal axes. The moment of realization that this explained the iron pyrites results was an occasion I well remember. I tried to explain it to an aunt who happened to be in the room, with indifferent success. I will select three further papers which appeared during this period as standing out from the rest. The first was a paper by my father, 'The Intensity of Reflection of X-rays by Crystals'. He showed that one could get a quantitative measure of intensity reflection, which was not affected by variations in orientation of the blocks of an imperfect crystal, by sweeping the crystal at a uniform rate through the reflecting position. Comparing the reflections from rocksalt with h, k, l even, he found that the intensities fell on a single curve when plotted against sin θ. This sweep procedure was the start of accurate quantitative measurement, and is still the standard method. My father also measured the Debye temperature effect on rocksalt. The precision of the measurements would be considered quite respectable today, and is remarkable when one considers the X-ray equipment available at that time. The second contribution was made by Darwin's two theoretical papers in 1914 on the intensity of X-ray reflection. Darwin calculated that a perfect crystal should give complete reflection over a range of a few seconds of arc. He realized that the actual reflection was too strong to be accounted for in this way, correctly explained the discrepancy as being due to the crystal consisting of slightly disordered blocks, and obtained the formula for the mosaic crystals. They were remarkable papers. It was not till after the war that X-ray analysis reached a point where Darwin's results could be used; in fact Ewald then quite independently calculated the same formulae without realizing that Darwin had established the theory at the very start of X-ray analysis. The third contribution appeared in my father's Bakerian Lecture in 1915; a quotation from it will show its significance: 'Let us imagine then that the periodic variation of density (in the crystal) has been analysed into a series of periodic terms. The coefficient of any term will be proportional to the intensity of the reflection to which it corresponds.' It was the start of Fourier analysis, and my father used it to get some idea of the distribution of scattering matter in the atoms. (a) The wave-length of X-rays had been established. (b) A number of simple crystals had been analysed, including several with one parameter, and it had been shown that this parameter could be fixed with a high accuracy by comparing the orders or spectra. (c) A method for the accurate measurement of intensity had been found. (d) The Debye effect had been measured. (e) We had Darwin's formulas for reflection by perfect and mosaic crystals. (f) It had been realized that each crystal diffraction corresponds to a Fourier component of the density of the crystal. (g) Finally, a whole new range of crystalline substances had become available through the powder method, developed in 1916 by Debye and Scherrer and independently a year later by Hull. In order to get a sufficient intensity, we used enormous crystals with the ionization spectrometer. We asked our colleagues to provide specimens an inch or two across if possible, though we had to be less ambitious in the case of diamond, which fortunately had a low absorption coefficient and gave very strong reflections. The powder method opened the way to examining microcrystalline material. The decade 1920-1930 witnessed a great advance in the application of X-ray analysis to more complex crystals, particularly inorganic crystals. I shall abandon the strictly chronological order and summarize the inorganic field first, leaving until later to recount advances in other fields. The advance was made possible in the first place by the development of measurements of absolute intensities, in the second place by the earlier results leading to an understanding of the principles which govern the structure of inorganic crystals, and this in its turn to analysing ever more complex structures. The absolute quantitative methods were based on Darwin's theory of diffraction by the mosaic crystal, which related the integrated reflection when a crystal was swept at a given angular rate through the reflecting position to the intensity of the X-ray beam falling per second on the crystal. The crucial. quantity is Eω/I, when E is the integrated reflection, ω is the rate of turning, I the intensity of the incident X-ray beam. A. H. Compton in 1917 had tested Darwin's formula with rocksalt and found that the absolute intensity of reflection was of the right order of magnitude. Bragg, James, and Bosanquet in 1921 and 1922 made a thorough examination of rocksalt, in which they estimated the effects of primary and secondary extinction, and determined the scattering curves of sodium and chlorine. Rocksalt was chosen for the experiment because a face can be reduced to an almost ideal mosaic state by light grinding. The importance of the variation with angle of the scattering by an atom (f-curves) became apparent, and Hartree in 1925 calculated f-curves based on Bohr orbits. Later in 1928, as the wave functions replaced the Bohr orbits, he recalculated their curves with his well-known 'self-consistent fields'. In the case of heavier atoms, their curves are very similar to f-curves calculated for the 'Fermi atom' which treats the electrons as an atmosphere around the nucleus. The peak of this line of work is represented by the paper by James, Waller, and Hartree on the Zero Point Energy in the Rocksalt Lattice. By accurate measurements of intensity of reflection at different temperatures, and by using Hartree's values for the f-curves based on self-consistent fields, they found that 'the f-curves so calculated agree very closely with the experimental curves on the assumption that the crystal possesses zero-point energy of half a quantum per degree of freedom, as proposed by Planck'. This understanding of the law governing absolute intensity was concurrently applied to problems of crystal structure. The integrated reflection for rocksalt (400), 1.09 x 10-4, for molybdenum Kα radiation, formed a convenient standard for establishing absolute intensities for other crystals. The first structure, I believe, which was based on the quantitative approach was that of barytes, BaSO4, analysed by James and Wood in 1925. It is an orthorhombic structure, with eleven parameters. A simplification was introduced by assuming the SO4 group to be tetrahedral, but the assigned structure was rigorously confirmed by comparing calculated and observed absolute values. One only has to recall that only a few years before a crystal with one or two parameters had been thought of as at the limit of determination to realize the power of the new methods. The tables in papers began to contain numerical comparisons of amplitude, instead of the mystic letters v.s., s, m, w, v.w. for very strong to very weak. In 1928 West and I wrote 'A technique for the examination of crystal structures with many parameters' in which we summed up our experience - a short guide to the art which might interest the reader nowadays who wishes to assess the state of knowledge at that time. We went on at Manchester to apply the new technique to a series of silicates, not because we were interested in silicates, but because their structures were of the right order of complexity and we could get ground sections perpendicular to the main zones and conveniently measure their integrated reflections. The first analyses were laborious frontal attacks. There were, however, three aids which increasingly enabled short cuts to be made. Niggli, Wyckoff, and Astbury and Yardley, had drawn up their tables for determining the space group of symmetry. In the first analyses the need for such a systematic survey was not felt; the structures were simple and we worked out the space-group in each special case ad hoc. Now we realize the usefulness of a directly determined frame-work of symmetry elements to which the atoms must conform. Next, ionic radii had been established. I put forward evidence in 1920 that they were additive, and Wasastjerna in 1923 corrected my radii to a more realistic set. The exhaustive survey of simple structures by V. M. Goldschmidt and his school established the radii securely. A classic case of the determination of a structure by space group and atomic radii alone was that of beryl. When West had found the space-group, I well remember that we worked out the structure in less than an hour, which surely must be a record for a quite complex crystal. The scheme of the silicate structure in general was beginning to emerge when Pauling in 1928 published his great paper on 'The Coordination Theory of the Structure of Ionic Crystals'. This paper was a real landmark, it revealed the fundamental principles underlying all inorganic crystals. It had its most striking illustration in the silicates, and I have always felt that the order and simplicity in their structures revealed by X-ray analysis is one that gave the deepest aesthetic satisfaction. I think the turning point in understanding silicates was the solution of diopside CaMgSiO3, by Warren and myself in 1928, because it showed the tetrahedral SiO4 groups to be linked by corners to form a chain of composition SiO3. Before that, chemists and mineralogists had postulated the existence of a number of acid radicles with different Si/O ratios. Taylor's analysis of the felspar structure in 1933 completed our knowledge of the main silicate structures. Two other lines of research started in this period, the study of organic crystals and the effective use of Fourier representation. The first investigations of organic crystals by my father were not really straight determinations of structure by X-ray analysis, a problem at that time far too complex for direct solution. Rather, it was shown that molecules of the shape predicted by organic chemistry, with bonds like those in diamond, could be fitted into the measured cells. My father examined anthracene and naphthalene in 1921, and long-chain compounds were measured by Muller and Shearer, Piper and Grindly, and de Broglie and Friedel in 1923. Later, in 1929, Mrs. Lonsdale determined hexamethylene benzene. These investigations were important as a first breaking of new ground. Towards the end of the period, in 1925, a new technique for crystal analysis took form, the two-dimensional Fourier analysis. I confess that the events at that time have always caused me a feeling of remorse. One-dimensional series were first used by Duane and Havighurst in 1925 to determine the electron distribution in the sodium and chlorine atoms, and they had been applied in a number of cases to establish electron distribution in sheets parallel to a crystal plane, based on the measurement of successive orders. Now about this time West and I had measured all the reflections, within a maximum value of sin θ, for the three principal zones of diopside. I had tried without success to see (what seems so obvious now) how such measurements could be used to get a two dimensional projection as a sort of tartan plaid. My father wrote to me to suggest the solution ought to come from a criss-crossing of Fourier elements in all directions, and a trial with our diopside data showed peaks representing the metal, silicon, and oxygen atoms. I wished to publish the paper with my father, but he insisted I should publish it alone. The first two-dimensional Fouriers appeared therefore as the three principal plane projections of diopside, though credit for its start is due entirely to my father. To sum up, I think the outstanding feature of the 1920-30 period was the development of accurate and absolute intensity measurements, which led in particular to a wide knowledge of complex inorganic compounds and so to a much deeper understanding of the principles which govern their structure. In reviewing the next period, 1930-40, I see it as the great era of the two-dimensional Fourier series, in particular as adding geometrical precision to the molecules of organic chemistry. Concurrently the powder method came to maturity in a field where it was particularly applicable, the structure of alloys. Two-dimensional Fourier projections demand a large number of measurements, since all the reflections around a zone are needed up to a maximum sin θ value which decides the resolution. It so happened that in the case of diopside these reflections had been laboriously accumulated with the spectrometer, but in general this instrument had achieved its successes by the accurate measurement of a limited number of reflections. Now more rapid methods of data-accumulation became essential. The rotation photograph was first proposed by Niggli in 1919, and the Weissenberg camera supplied the need, combined with accurate photometric measurements of the spots. A paper by Bernal in 1926 had systematised the interpretation of these photographs, and a definite technique was established. The organic crystals examined were centro-symmetrical and one only needed signs in phase determination. Trial and error, based on stereochemistry, gave a rough solution which yielded the principal signs, and with them a Fourier projection was calculated and refined by deducing further signs. As an example of this body of work I may cite the series of papers by Robertson and his school. In 1932 he refined anthracene, then analysed durene, dibenzyl, benzoquinone, resorcinol, hexamethylene benzene, and other molecules. These structures had a number of parameters in the 20-30 range. A landmark was the direct determination of phthalocyanine with 60 parameters, made possible by the substitution of a heavy atom at the centre of the group. The molecules in each case confirmed the structure predicted by the organic chemists. The new contribution was the accurate determination of bond-lengths and bond-angles, and their interpretation in terms of the nature of the chemical bond. The Fourier series thus became the major method of attack, using measured amplitudes and postulated signs, as opposed to the older methods of moving atoms about till the diffraction effects were explained. Patterson's famous paper 'A Direct Method for the Determination of the Components of Interatomic Distances in Crystals' appeared in 1935. The 'Patterson' was the first of a series of discoveries about the ways Fourier series can be manipulated for the purposes of X-ray analysis, a series which seems to come from an inexhaustible mine. New applications are continually being found. We think now in terms of Fourier series and reciprocal lattices, and it is in the present era of our review that this new trend in crystal analysis became established. Westgren in Sweden started his study of alloys in 1921, and was the pioneer in this field. He was followed by Bradley who worked with Westgren and published the well-known structure of γ-brass and α-manganese in 1926 and 1927. But it was in this 1930-1940 period that Bradley and his school made their great contributions to the studies of alloys and alloy phase-diagrams in a brilliant series of papers. The powder method was employed with a virtuosity which has perhaps never been excelled since, if indeed it has been equalled. Highly complex structures were analysed. The knowledge so gained enabled Hume-Rothery's electron-atom ratio postulate to receive an explanation by Jones in terms of Brillouin zones. Phase boundaries in binary and tertiary systems were accurately outlined. The order-disorder transformation was explored by Bradley and by Sykes, and led to theoretical treatments by Dehlinger and by Williams and myself, and even proved to be so fascinating to the theorists that Bethe and Peierls were led into giving it their consideration. It is no exaggeration to say that the principles of metal chemistry for the first time began to emerge. This brings the story up to the beginning of the Second World War, and it is convenient to resume it at the end of the war and take as our next decade the period 1945-1955. Acta Crystallographica started publication in 1948, providing the X-ray crystallographers with a journal of their own. The excellent way in which the journal has been edited by Ewald and his co-editors has had the most beneficial effect on the advance of our subject. In particular we in this country owe a great debt to R. C. Evans who gave so much of his time and energy to Acta. Instead of having to look for new work in many journals, we could be sure of keeping abreast of new developments by finding all the most important work in this journal. A glance through the numbers of the journal shows the general trend during the period under review. The majority of papers represent the exploitation of the methods which had been developed or at least foreshadowed before the war, applied to organic compounds, inorganic compounds, and alloys. Many improvements to the techniques were made, resulting in the successful solution of more complex compounds, in increasing accuracy of the determination of the atomic arrangement, the detection of the position of hydrogen atoms, and the measurement of individual thermal vibrations. The volume of work is so great that it is hard to single out individual achievements without a feeling that injustice is being done by not mentioning many others. I shall have to give up any attempt to summarize what may be described as the vast extension of crystal chemistry by the use of the established methods of analysis, and confine myself to what I see to be the outstanding achievements which broke new ground. In the organic field, most determinations of structure had hitherto confirmed the structural models of the organic chemist. Now a very difficult kind of 'sound barrier' began to be passed, that of telling the organic chemist something he did not already know. I may perhaps select the determination of the structure of cholesteryl iodide by Carlisle and Crowfoot (Mrs. Hodgkin) in 1945 as an early example of such an achievement. Bernal's studies of the sterols in 1932 had given some indications of their structure, and in the interval the chemical nature of the sterol structure had been largely established by the organic chemists. Carlisle and Crowfoot, starting with clues to the phases indicated by the heavy iodine atoms, were able to fix the positions of the thirty-three carbon atoms in the asymmetric molecule, and so establish the sterol skeleton with precision. - Then there was the neck-and-neck race with the organic chemists for the solution of the structure of strychnine. Bijvoet in 1947 obtained a first rough Fourier synthesis of the sulphate on the 010 plane, getting signs by comparing sulphate and silicate. In 1948 he attained a precise projection, with which only one model was compatible, unaware that just previously Sir Robert Robinson had succeeded in making the right choice between alternative models on chemical grounds. These papers which established the structure of strychnine are models of brevity, some two pages in length, which might well be studied by our more diffuse writers! The results were confirmed by Robertson and Beevers. 'The X-ray Crystallographic Investigation of the Structure of Penicillin' by Crowfoot, Bunn, and colleagues, is famous. The investigation lasted over four years. Success was the result of team work in which the chemists and crystallographers made essential contributions. To quote from the paper: 'Throughout the whole of the X-ray crystallographic investigation of Penicillin we have been working in a state of much greater ignorance of the chemical nature of the compounds we have had to study than is common in X-ray analysis.' A large variety of X-ray techniques was employed to establish the structure both of the degradation products and of the complete molecule. The description of the analysis is in itself a small text-book on X-ray analysis. The 'sound barrier', to which I have likened the surpassing of the bounds of the organic chemists' knowledge, was broken through with a loud report in the case of Vitamin B12. Crowfoot and colleagues published their completed analysis in 1957 after eight years study. The asymmetric molecule has the composition C63H88Ni14O14PCo, and a vital role in the analysis was played by the heavy cobalt atom. In some respects the chemical evidence was definitely misleading, and the establishment of the structure was mainly due to X-ray analysis. We all recognize this analysis of B12 as an achievement which stands in a class of its own. A noteworthy event in this period was the establishment of methods for determining all the characteristics of the space-group symmetry of a crystal. After we had been pointing out for many years in our lectures and papers that it was impossible to detect whether a crystal had a centre of symmetry by X-ray methods alone, Wilson showed us how to do it by a statistical survey of the distribution of diffracted intensities. Like all brilliantly original ideas, it seems so obvious when pointed out. The last element of uncertainty was removed by Bijvoet and his colleagues who used the phase-change in scattering to distinguish between a right and left handed configuration of atoms. They established the absolute configuration of the tartrate ion in sodium rubidium tartrate. It was of course an even chance whether the actual configuration corresponded with the 'd' and 'l' convention of the organic chemist; actually it turned out to be in accord with the convention. Another very interesting body of work in this period was the series of papers by Karle and Hauptmann, Harker and Kasper, Goedkoop, Sayre and others which appeared from 1950 onwards. They constituted an attempt to solve a structure by direct methods. The phases of the structure factors must be such that, combined with the measured amplitudes, they give a 'reasonable' answer. They must, for instance, produce a Fourier in which the densities are everywhere positive, and outline nearly spherical atoms with an appropriate electron distribution. This consideration is of course the basis of all trial and error methods which start by assuming the presence in the structure of such atoms, and seek to find their positions. These authors attacked the problem from the other end, seeking to get general relationships between the structure factors which must hold because of the physical nature of the diffracting body, and which would lead directly to establishing a number of phases sufficient to determine the structure. It is perhaps fair to say that this fine body of work has not, in actual fact, had the influence on structure determination it deserved. It had the misfortune to come too late. The relationships can only be based on F-values whose strength is in reasonably high proportion to the maximum possible value. As crystals increase in complexity, such high values become increasingly rare, and by the time their methods were established the power of X-ray analysis had so grown that it had outflanked and taken the positions assailed by the direct attack. To sum up the 1945-55 era, I see it as the extensive development of a large body of techniques based on the earlier trial-and-error methods, but now becoming so powerful that they were breaking new ground in all fields of crystal chemistry, and reaching a stage where they could tackle problems of chemical constitution which had proved impossible to solve by other techniques. This brings me to the present era, and here the thrilling feature has been the successful application of X-ray analysis to biological structures. The model of the spiral structure of the polypeptide chain, the α-helix of Pauling, Branson and Corey, was first deduced on theoretical grounds supported by a study of the form of amino-acids and simple polypeptides. It soon received confirmation from the treatment of X-ray diffraction by helical structures in general by Cochran, Crick and Vand, and its application to the diffraction pictures yielded by artificial polypeptides. This analysis was used by Crick and Watson to explain the excellent pictures of nucleic acid (DNA) which had been obtained by Wilkins, and in 1953 they published their structural scheme of the atomic arrangement in DNA which has aroused such intense interest and has led to further researches in a number of laboratories which have confirmed its essential correctness. The transform of the helical structures, expressible in Bessel functions, also led Watson to deduce the helical nature of rod-like viruses. The diffraction pictures of the globular viruses led Caspar to suggest that they were a cluster of similar protein molecules in a symmetrically arranged point group. Further developments by Crick and Watson and by Franklin and Klug have given us a much deeper understanding of the general architecture of virus particles. X-ray analysis has also been applied to the structure of collagen and of muscle. These cases present the novel feature that one is dealing with the transform of asymmetrical arrangement which is not part of a space lattice. Advance at the present time is so rapid that I must be content with a very brief reference to these very important researches. The analysis of the proteins myoglobin and haemoglobin by Kendrew and Perutz is more in line with former work in that the goal is the complete determination of the atomic positions in molecules of definite structure arranged according to space-group symmetry. The new feature is the high complexity of the structures which have been successfully analysed. The molecule of vitamin B12 contains 181 atoms, and its analysis represented a landmark in the solution of a complex molecule by what might be termed classical methods. Myoglobin of molecular weight 18 000 contains some 2500 atoms, and haemoglobin is four times as large. It would have seemed almost impossible to tackle such structures only a few years ago. The model of the myoglobin molecule is something quite new in science, and poses fascinating problems of the interplay of forces in this vast array of atoms and the way in which they determine the chemical behaviour of the compound. One feature is the complete absence of trial and error methods, and the directness of the approach with no assumptions about the kind of answer to be expected. Nature has, as it were, given us an unexpected break. On the one hand there is the formidable complexity of a molecule containing many thousands of atoms. On the other hand, the very size of the molecule makes it possible to attach heavy atoms, often associated with quite large complexes, in various places without a disturbance of the arrangement of the molecules in the crystal. As it were, the molecule takes no more notice of such an insignificant attachment than a maharaja's elephant would of the gold star painted on its forehead. The attachment of such atoms in a sufficient number of places makes possible a completely direct determination of phases and so a solution of the structure. Taking advantage of the presence of a heavy atom, or of the possibility of isomorphously replacing one heavy atom by another, is of course a classical device, but this addition of heavy atoms in various places is new. Next, because the approach is direct, clear instructions can be given to our slaves, the electronic computers, to work out the vast number of calculations required. The collection of data has also become automatic, and the main application of the investigator's judgement is to the interpretation of the data turned out by the machines. I am not minimizing the ingenuity which has led to the discovery of how to attach the heavy atoms chemically, to the design and accuracy of the recording apparatus, and to the programming of the data fed into the machines. The new feature is that the element of guesswork has gone, and been replaced by the handling of vast masses of measurements and calculations. The nearly complete solution of the myoglobin structure by Kendrew, and the first outline of haemoglobin which will no doubt soon be also extended to a higher resolution, represent the result of some twenty years' study of these two molecules. One cannot but admire the tenacity and faith which led to the final success after so many years with few encouraging results. The other outstanding feature, to my mind, is the bridge which has been established between two ways of studying the structure of living matter. The electron microscope has been improved until now it is able to resolve bodies which are of the order of ten atoms across, so containing thousands of atoms. X-ray analysis has now reached a point at which it can place the atoms in molecules containing thousands of atoms. For the first time we shall be able to study the structure of matter right down to the atomic scale. As I have worked for so long in this field, it will easily be understood how deep a gratification it is to me to witness the growing power of X-ray analysis and see how far it has progressed from the early days I remember so well. I end this lecture with a graph, in which the years are plotted horizontally, and the number of parameters in typical structure determinations are plotted vertically on a logarithmic scale. 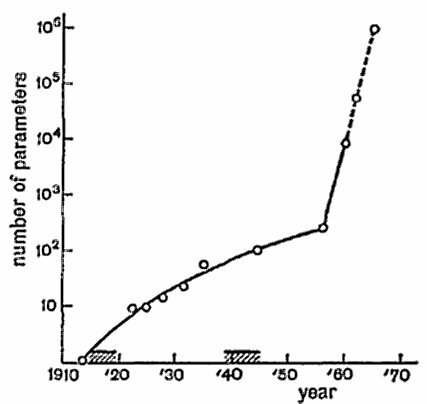 The curve starts with one parameter in 1913. It shows a sharp break at the exciting present time, and in tracing its course I have ventured with some confidence to assume that the haemoglobin structure will be completed next year. If we prolong the graph we conclude that we shall reach the million mark in 1965. This is not so improbable as might seem; is there not hope that by that time we shall know the atomic architecture of a simple virus? How the million parameters will be listed in Acta is a problem I leave to the editors at the time. I have high hopes that I shall see the great day. Fig. 8-1. The growing power of X-ray crystal analysis.